My name is Jeannie Seymour. I am one of four pensioners living in Deptford Creek. I moved here in February 1996, when I first met Julian Kingston. Julian had been living here quite some time and it was he that suggested that his brother’s catering company buy the land he was moored against. Julian was their manager so of course it was more convenient for him. It was absolutely magical. Julian’s boat Sabine, was the only boat in this arm of the creek. We had the whole place to ourselves in the evenings and at weekends. There was no DLR, no one in the college, no one in Mumford’s Mill, no flats at the end of the creek either. We could even star watch because we had no light pollution and we could sit out on the deck watching the water undisturbed. In those days we had huge Mirror Carp and Brown Trout that could easily be seen swimming around slowly and the Cormorants dived in and out of the water looking for smaller fish. Julian bought a Mirror Dingy for sailing around in the basin and we also used it to visit friends who were moored behind the Skillion Business Centre near the Pumping Station. 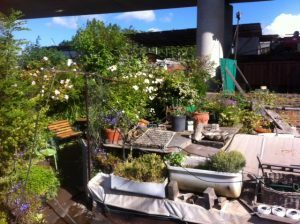 We and our friends also became involved in local meetings set up in 1996 by Gill Goddard from Lewisham Council, as part of the Creekside Environment Project. 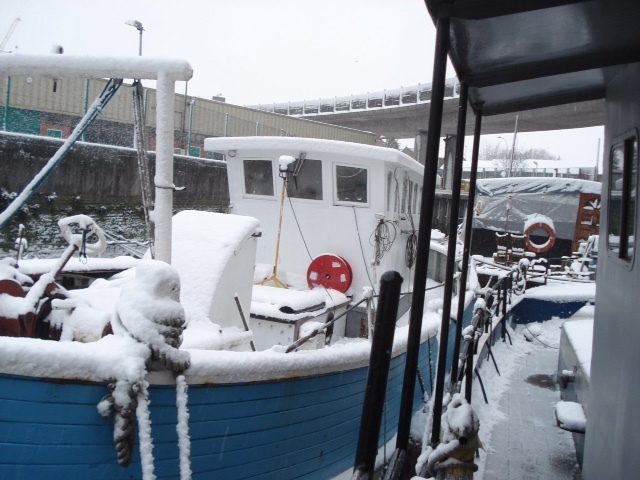 These meetings included Gill along with a student, Nick Bertram the local botanist, Dusty Gedge and Mike Paice the ornithologists, Jess Steele and Richard Walker from Groundworks, the people who lived on the boats and the odd extra person from time to time. Our usual meeting place was a room in Cockpit Arts and when that was no longer an option, a room in Greenwich West building. 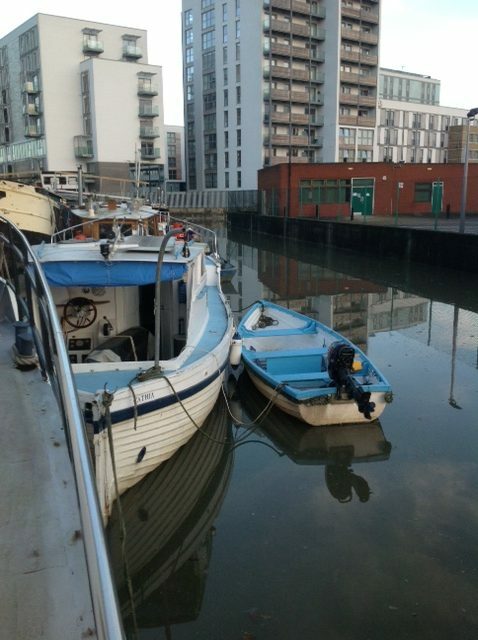 We discussed ways to benefit Deptford Creek, including, removing rubbish from the creek, protecting the wildlife, and the boaters. The Project was instrumental in having the timbers put up along the creek to encourage natural plant growth and habitats for nesting birds. It also put pressure on developers at the mouth of the creek to install ‘green rooves’. This was all before the Creekside Discovery Centre opened. That first year in the creek was wonderful. We even went on a holiday taking Sabine up the East Coast into the Orwell and the Blackwater. Sabine looked different in those days. The wheelhouse was separate so you needed to go out of the galley to get to it. 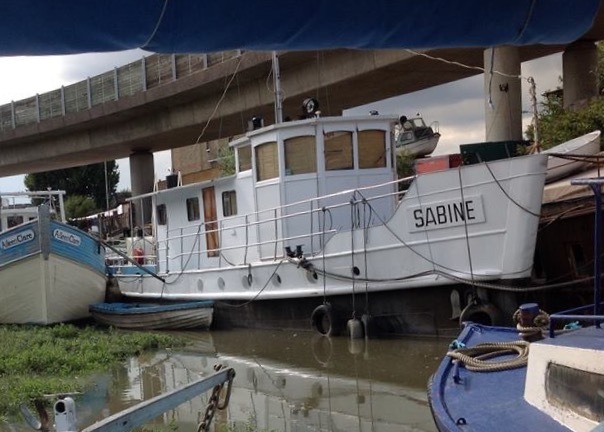 Our bathroom was on the other side of the wheelhouse wall, where the dining area is now. The lounge below was smaller because Julian’s son Josh had a bedroom next to it. When he left home, Julian used some of the space his room occupied to enlarge our lounge area. The rest of what was his bedroom is now our bathroom. We now only have one bedroom but Julian devised a way to convert the dining area into a double bed if ever guests need it. The following year our idyllic life changed. The Dockland Light Railway said they wanted to use the land to build the Lewisham extension on. They paid Julian’s brother a huge amount of money and relocated them in Surrey, with an agreement to give them the land back when they had finished. They hadn’t factored us into the equation and we had quite a battle to be temporarily relocated on the other side of the island, under Mumford’s Mill in Deptford College, which had just taken over the old ‘Skill Centre‘. They had to provide us with our own compound to store our cars and Julian’s container as well as having access to our boat. You can still see our ramp which was left hanging from the college wall when they moved us back to our original mooring. 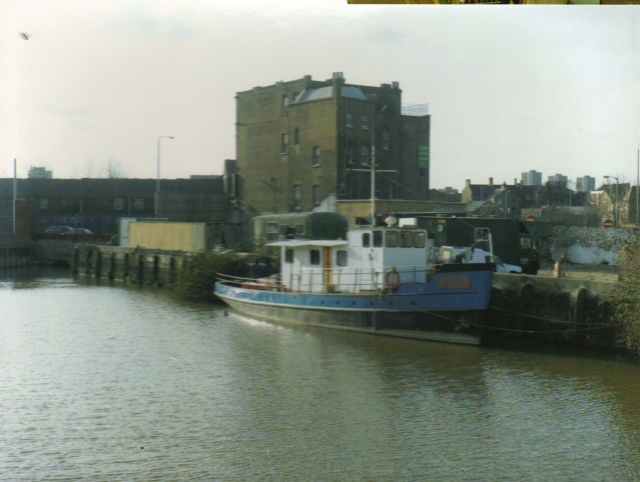 During the time we were temporarily moved Julian and I got married, and Julian also obtained another boat, a Thames Lighter that had been used as a fireboat in the Millennium River of Fire, which eventually became our workshop and garden. When we finally returned it was now with the Dockland Light Railway nearly above us. We are quite fortunate this end of the creek because the DLR had to install sound-proofing for us. 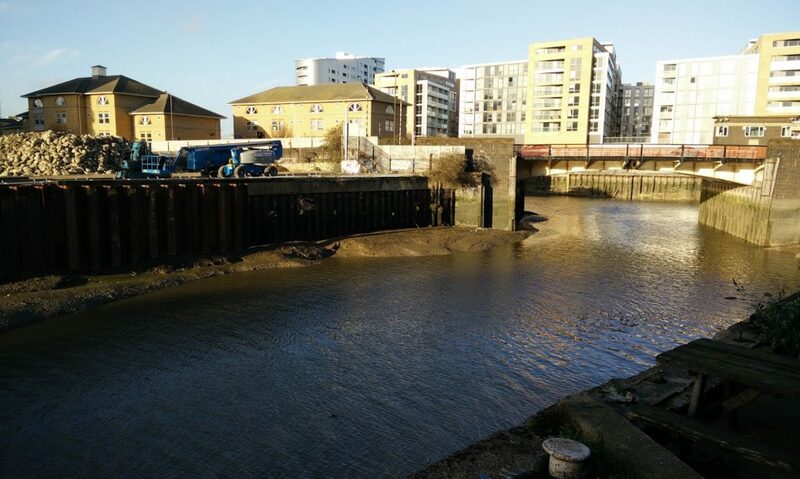 This does not apply anywhere else in Deptford Creek. As Julian’s brother’s firm had already relocated they were then left with an empty plot of land that they wanted to sell. We proved a thorn in their side and despite a court battle they were left having to sell the land with us on it. The landowner has shown no interest in the creek other than viewing it as a potential money maker for future development of his land. Over the years more boats arrived in the Theatre Arm. We had a really funny experience when someone tried to bring their large boat to a mooring further up the arm than our boats. The trouble was, not knowing the creek, he hadn’t estimated how shallow it was at that particular time and got stuck in the mud right outside our kitchen door when the tide started to fall away. He was stuck there for a couple of weeks until the levels of the tide allowed him to move again. We had been entertaining friends at the time and they were so excited to be invited onto his boat. It proved quite an adventure for them. But having such a huge boat stuck right outside our door blocking the light, with the owner and any of his visitors having to climb over our boat, was a real inconvenience. He was a really nice chap and we became very good friends though he is no longer in the creek. The tides do take a bit of getting used to. We have high tides and low tides at different times of the day and month. You really need a Tide Table to forecast them. When my grandchildren wanted a boat trip down the creek I would have to plan their visit when the tide was in the daytime and not at some unsociable time. Most of the time we are sitting on the mud though. In the summer time the mud has lots of water pepperwort growing so I think of it as our garden. It provides lots of hiding places for the chicks when they are hatched. Landlubbers might think we are strange but actually we are no different from them. Our boat has a TV, a bath, central heating and we pay Council Tax too. The only difference with us is we go up and down on the tide twice a day.